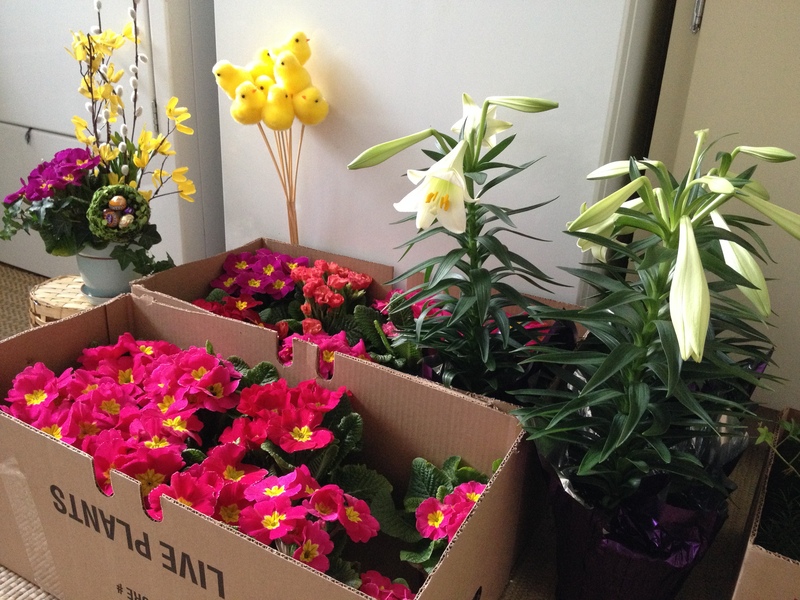 Every thing’s coming up…Primula and Lillies and Chickens and…! So Yes. Spring had arrived…much earlier than last year. Easter was a little earlier too. I managed to get more orders for my little table top centre pieces. I even did a few large baskets with a Lilly – Hyacinth mix. Very smelly…but in a good way. If you like that sort of thing. How ever nice the weather looked, it was still pretty chilly so I set up office in my laundry room!! (See 2nd Photo) I love THAT kind of office environment!!! The weather the week before last was unbelievable. People went crazy…dressing in shorts and little sun dresses. Thats what some people do in Canada. The winter is sooo long, as soon as the sun pops out it’s a full wardrobe change. I was very lucky and just enjoyed working out doors and getting people spring-a-sized. 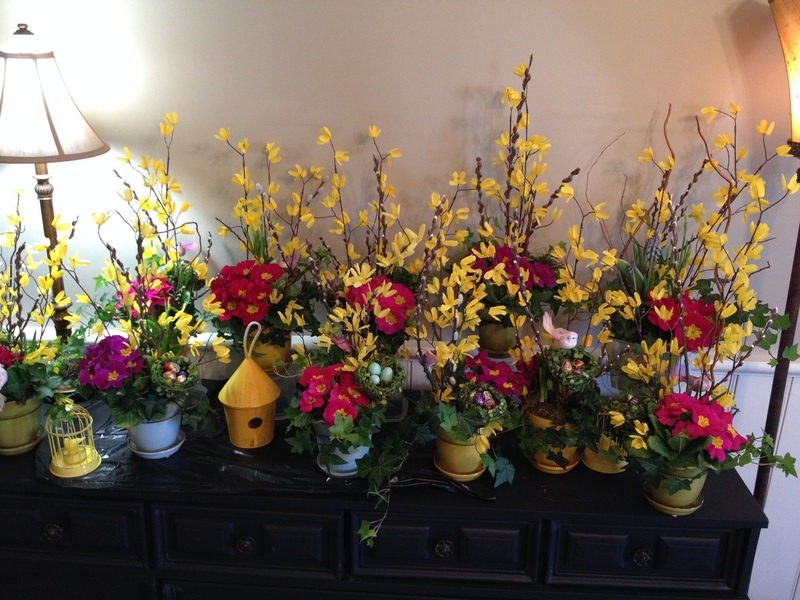 Filling containers with Daffodils, Tulips, Pansies, Primula. Even a touch of Ivy. I knew. I really did know, that we would have to see a little bit more winter before it went away completely. But the bulbs and Spring flowering plants are tough little souls and would stand up to the wintery blasts…if the blasts didn’t stay around too long. The secret is the use of faux branches and flowers. I know, I know, some of you don’t want to put “that stuff” in your planters but it helps to keep the containers looking colourful before and after the real bulbs have bloomed. It’s a short season, we have to make the most of it! For the short seasons…Spring and Fall, I like to add embellishments to the containers. If you’ve seen my blog for Spring, you can see my like for Birdy-ness! Nests, houses, birds. This year is no exception. 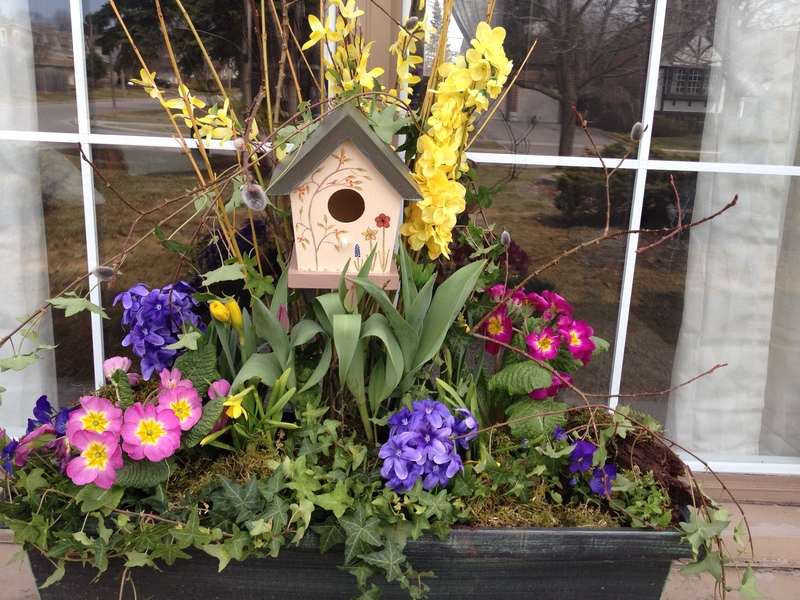 For the Spring window boxes, (see 3rd photo) I think it’s the perfect embellishment…a shout out to my Mum, who Loves painting these little houses….At least I think she loves it! « I finally Finished Mine!